Fort Scott Community College (FSCC) offers email services for students through Google for Education. A student may use an FSCC-provided Google account to access core Google services such as Gmail, Google Drive, Google Calendar, and Google Docs. There are a number of Additional Services available to students courtesy of Google; please see the list of these services below. 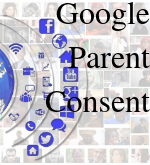 Google requires written parental consent in order for students under the age of eighteen to access these Additional Services. Advising – any advisor in Bailey Hall will accept the form and deliver it to the I.T. Department. If you have questions or concerns, please send an email to googleconsent@fortscott.edu. We will review your message and respond as quickly as possible.